The Cosmos, our Universe, our Earth, is composed of living conscious energy … the conscious energy of geometric light and crysto-electromagnetics. Our Earth is multidimensional, and so are we. Twelve dimensions exist upon our planet; 356 dimensions reside in our Universe. Geometry, sacred geometry, is the mosaic underpinning of them all. 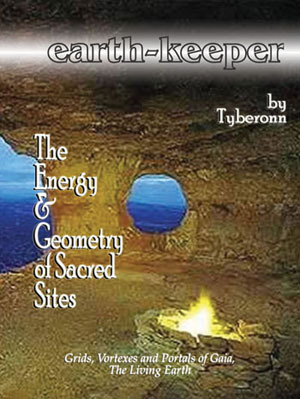 This extraordinary book contains a comprehensive listing of powernodes and sacred sites in every country on the planet. It clearly explains the different types of sacred sites and powernodes and how each type provides an embellished energy with a living, conscious 'Spirit of Place'. Explanations of Telluric Energy Forces of the Living Earth (Gaia) including Leylines, Portals & Vortexes are explained in both metaphysical and scientific terms. A listing of Leylines is included. Our planet contains a three in one grid complex that encompasses the Earth. This grid system enables and facilitates our experience on the planet and the sacred geometric fabric of reality we live within. The nature of Cosmic and Planetary Grids are discussed in detail. In specific places on our planet, these grids are unified into concentric vortex-portal templates and allow for all 12 dimensions to occur in a more tangible manner within a concentrated area, which I refer to as zipped space or harmonic dimensional overlay. When we as humankind enter into these special areas, we become immediately affected. One’s energy increases, one’s awareness is enhanced and one’s multidimensional aspects are more tangible. USA orders please allow up to 3 weeks for delivery by standard post. Canadian and European shipping by standard mail please allow up to 6 weeks from date of shipping for delivery. Receival times will vary according to customs procedures in each country. Please email if you wish expedited Fedex courier shipping at an additional fee. Thank you !